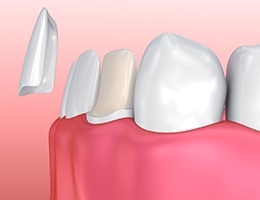 For front teeth that are affected by multiple or severe imperfections, porcelain veneers in Ann Arbor, MI provide a truly transformative solution. These thin coverings are affixed to the front surface of the teeth -- instantly improving their size, shape, color, and overall appearance. How are porcelain veneers put onto the teeth? And, how do porcelain veneers hold up over time? Let’s take a look at these and other questions regarding veneers. How Are Veneers Placed onto the Teeth? The first visit is used for preparation. You and your dentist will discuss your smile desires and a treatment plan will be put in place. Your teeth will be prepared to receive the veneers during this appointment. Following the removal of a small amount of tooth enamel, impressions will be taken. 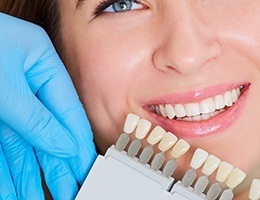 You will leave this initial visit with temporary dental veneers. Two weeks between the first and follow-up visit are needed for the manufacture of your veneers. Dr. Olsen will send your smile information to an off-site lab where an expert ceramist will craft your veneers. At your second visit, the veneers will be ready for placement. Dr. Olsen will check to make sure the veneers look and fit just like they should. Once you give the final okay, each veneer will be bonded securely to the surface of your teeth. When cared for properly, porcelain veneers can last for more than ten years. Periodic maintenance may be necessary. Since porcelain looks and acts just like natural tooth enamel, it won’t “fade” or lose its sheen. But even better than your natural teeth, porcelain is highly resistant to stains. It will not darken at the same rate as the rest of your teeth -- and dental polishing can restore the luster of porcelain veneers. Schedule an appointment with Dr. Olsen to learn whether or not porcelain veneers are a good option for your smile enhancement. Most patients who wish to undergo this cosmetic treatment are eligible candidates. Patients who have very crooked teeth or who are in poor dental health, however, may not be suited for porcelain veneers. Sometimes, a dental crown is a better option than a porcelain veneer. If you have dental issues that affect the strength of your teeth -- like severe breaks, worn teeth, or decay -- a dental crown may be necessary.